Thanks to those who prayed for my trip up to Tohoku, the tsunami stricken area. Given that the hygienic situation is bad, as the news told about some people who got the smallest cut on their finger while cleaning up the debris ended up almost dying from tetanus, I was initially pretty nervous of this trip. And this was going to be my first time away from Allie at night. Also as you age, no matter how young you might feel at heart, you also know what your body can handle. Knowing the sleeping condition was going to be miserable, I also wasn’t sure if I could handle all my tasks or even come home healthy. But the Lord was good. This trip turned out to be far better than what I expected: great team, meaningful work, and sustained energy and health despite the living conditions. I went up to north, helping lead a college group that came from California. 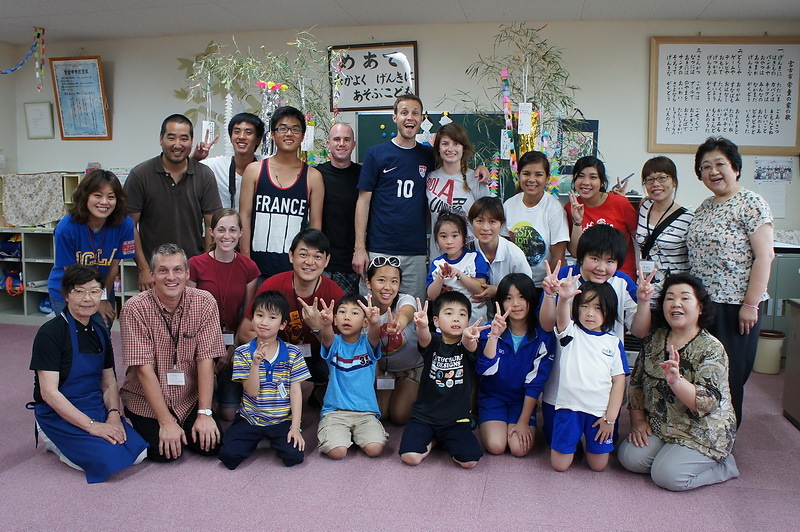 They were a wonderful group of kids, passionate about God, wanting to share the love of Christ who came all the way to Japan across the ocean to be the hands and feet of Jesus. To me, this trip was as much for these college kids as for the tsunami victims. Of course, I wanted to see this once in a 1,000 year disaster that happened to my people with my own eyes and do whatever I could to love and serve these people no matter small of a part I would play in light of the scale of this disaster. But at the same time, as a former youth pastor, I also understand how much of an impact a missions trip can make on the spiritual life of the youngsters and I wanted to serve these kids so that their faith might be stretched and that this trip can somehow affect their future decisions. It took us all day to get up to Miyako-city in Iwate Prefecture. Since we got in so late, we had no time to go to the bath house, meaning no shower. We only drove that day, so can’t get too dirty, right? Sleeping directly on the tatami mat was a lot harder than I thought. I probably slept just about an hour and started a new day. 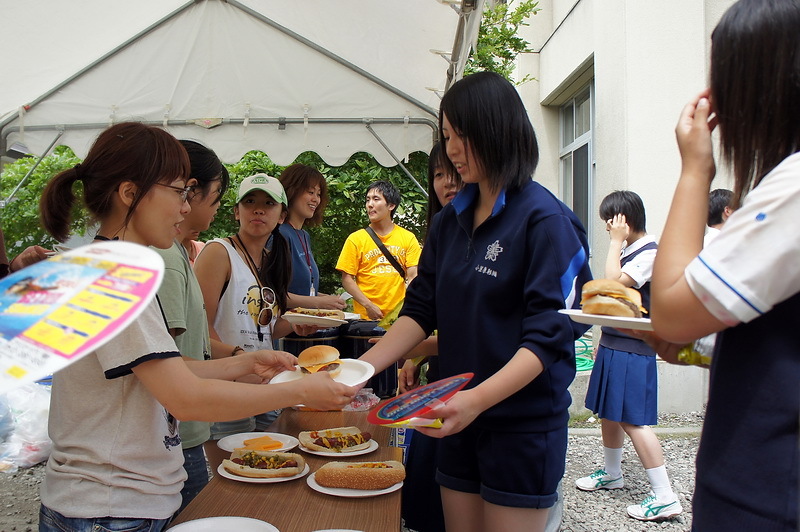 Our first day’s task was to serve 200 meals at an evacuation center in Otsuchi. It’s a local high school where its gymnasium is used as a temporary home for 200 people who lost their homes. The classrooms are still used as a normal school facility where students study and take classes. We did the all American cook out: a cheese hamburger, a hot dog, a bag of chips, and a slice of watermelon, all on the same plate. That was a humongous portion, almost too much for a tiny Japanese stomach, but no one except one person declined getting all the food they could get. After serving everyone in the evacuation center, we began feeding the high school students as well since we still had enough ingredients. These kids acted so happy and almost made me believe that they weren’t quite affected by the tsunami. I was wrong. Since we took some photos with them, I thought we could send some to their home. When I asked a boy for his email address, he said, “Sorry, I can’t use the computer right now.” Of course. I expected this answer. Then I asked for his home address. Instead of hearing a house number and area name, what I heard was a name of a local evacuation center. Then it dawned on me that this boy really lost his home! It was a very humbling experience. I wondered how many of those 300 students who received our meals with smile, giggling with their buddies and bravely practicing English actually lost their homes or loved ones. One meal (not even nutritionally balanced) was the only thing I could give to these precious people. If I could bring delight just for a second, it made my day and surely God’s day. Our second day involved a very unglamorous job of sorting through the debris. Once sea water covers anything, it gets contaminated by the salt: wood, plants, and even soil. 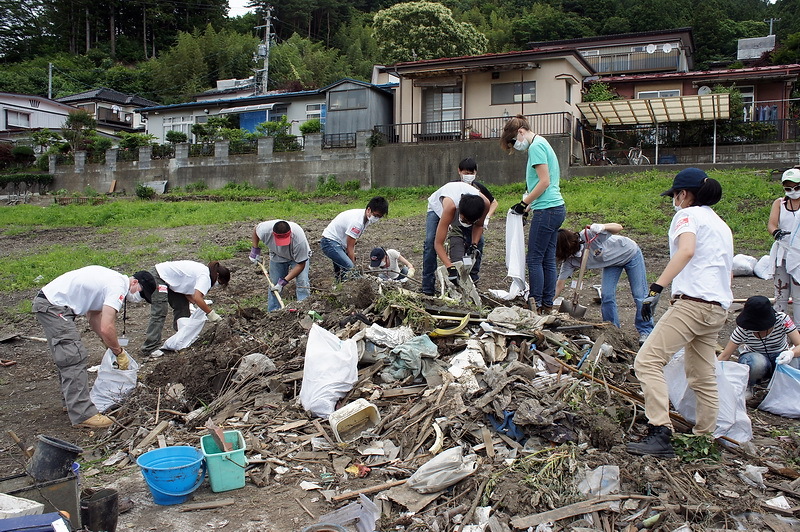 In Otsuchi, there were several huge mountains of trash sorted by category. This type of sorting is done by heavy machinery, but the rest of small piles have to be done manually. We separated any stuff, whether broken glass, wood, or plastic, from the dirt, and bagged everything so they could be disposed at appropriate places. We were a group of fourteen people and yet it took us all day to clean up a small pile of debris. Week by week, the number of volunteers has been decreasing. It made me wonder as I looked at many more trash piles all around me, how much longer it takes to clean up all these garbage. And this is just one little town. There are many more cities that were hit hard all along the Pacific coast. As were were sorting through the trash, we stumbled across a photo album of a lady and a bag full of Ultraman toys that once belonged to normal rural families, perhaps fishermen’s families. It was great to have been able to rescue these memory items as many escaped without anything. Hopefully the owners are still alive and they will find these little treasures that bring back their old memories. Our third day was a pretty eventful day. In the morning we cleaned up the garden of an old lady’s home as the salt water killed her plants. Her house was along the river where tsunami went up against the current and flooded over the bank. Later that morning, we went to the other side of the river to help with the Rapeseed Flower Project. There were eight bodies found along this river bank and the local people wanted to do something to mourn these victims. We weeded for couple of hours to prepare the soil for the planting of the flowers. We grabbed a quick lunch (convenience store food) on the go as usual and headed for an afterschool care center where elementary school kids with working parents go after school. Kids were so cute! They were so shy with strange looking people yet many of them introduced themselves in English. We sang songs, gave gifts, and did crafts. Gospel bracelet making was particularly fun. American girls taught the kids how to make a gospel colored bead bracelet: yellow (for God and his glory), black (for sin), red (for Jesus’ blood and love), white (for our sins forgiven), and green (our growth in Jesus). Since teachers were sitting near us, I invited them to join us with the bracelet making. It was so strange to see these non-Christians being so receptive of the gospel story behind the beads. It brought a smile to my face to see one teacher teaching the gospel to another teacher. But the smile eventually faded away as I sat with a mom of one of the kids, Ran-chan, and one of the teachers. I heard sad stories firsthand from these ladies. As a mother of a baby, I empathize with other moms of a small child. Ran-chan is still a first grader, yet lost her grandparents and uncle all at the same time. She was emotionally unstable and downcast for a while and it’s very recent that she began smiling again. Her mom was happy to see her play so hard with our team. One of the teachers at the center died as well. As I teared up, tears naturally rolled down from their eyes as well. In a brief exchange, they could sound as though tsunami was a thing of the past, but in a long enough conversation, they let you see that it’s still very real. Again realizing my own helplessness, as a least thing I could do, I offered to pray for the teacher. She was very thankful and asked me to come back again. Oh, how I want to…. The next morning, we hit the road to go southward along the coast line to visit a few churches that were struck by tsunami. We prayed for every church we visited. A church in Kesennuma – now famous after the tsunami – was completely washed away, but they cleaned the floor and built a cross with driftwood, and still have a worship service on Sunday in the open air. It was simply a beautiful sight: an exposed sanctuary in an open field. May God bless these churches to bring the good news to many! After a long drive back to Tokyo, I was so eager to be reunited with my little princess. Having hugged Grant briefly at the door, I dashed to Allie who was eating dinner in her high chair. As soon as she heard my voice, she turned and gave the biggest smile ever to have her dear mama back…..so I wished…. In reality, she gave me the coldest stare and went back to her food silently. To make it worse, when I tried to pick her up, she began screaming! My crushed mommy spirit was at least comforted by my uplifted missionary spirit. « You Might Be a Gaijin (Foreigner) In Japan If……. Thanks for sharing! 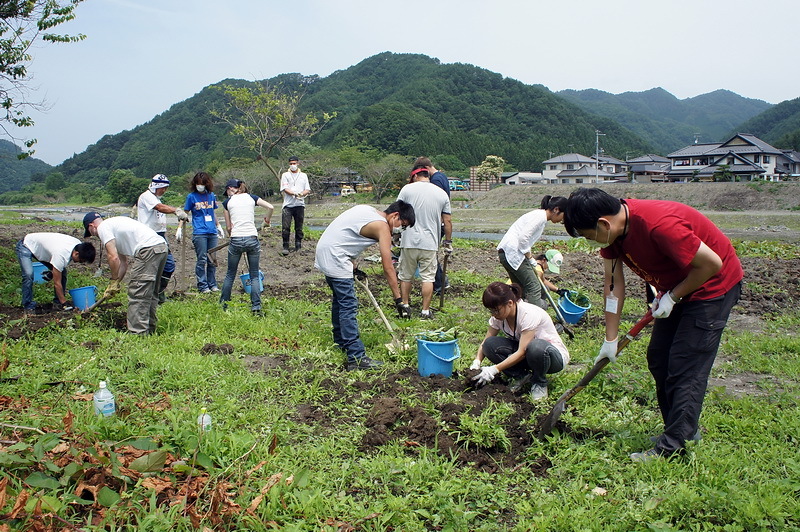 And thanks for coming over to help in Northeastern Japan. Things are still very hard, and lots of people are still without homes, but I think you’d be amazed to see the amount of progress that’s been made in the months since you visited. The gardens have even come back — and run wild; it’s startlingly overgrown in Tohoku these days.